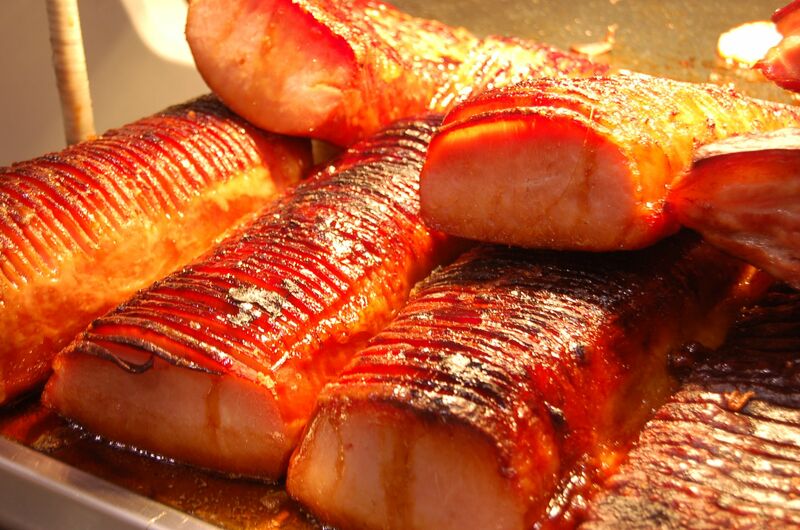 Peameal bacon (also known as cornmeal bacon) is a type of bacon originating in Toronto, Canada. The name reflects the historic practice of rolling the cured and trimmed boneless loin in dried and ground yellow peas, originally for preservation reasons. Since the war years, it has been rolled in ground yellow cornmeal. It is low in fat, and slow cured. Bacon made of pork belly instead of the loin is not as lean. Peameal bacon is made from boneless pork loins, short cut from the leaner portions of the loin, to ensure a more uniform product. External fat is generally trimmed to within 1/8 inch (3 mm). Smokeless and tender, this product is sweet pickle-cured and rolled in a traditional golden cornmeal coating. Peameal bacon sandwiches are often considered to be a signature dish of Toronto, with the most famous vendors located at St. Lawrence Market. A pork loin is pickled in brine, then rolled in cornmeal and grilled in medium sized slices until the centre is slightly rare and the cornmeal coating and external fat turns crisp in the grill. It is often served as a sandwich; the above prepared bacon is then served on a Kaiser roll. It is usually a general practice to add mayonnaise, lettuce, and tomato. Other common ways of consumption are roasted and glazed with maple syrup or roasted with pineapple and cloves. A Toronto, Canada based ham and bacon curer, William Davies, developed the bacon and his idea was taken on by people from Wiltshire, England who had emigrated to Canada. After they had successfully manufactured peameal bacon and turned it into a Canadian family favourite, it could be bought even in a local grocery store or butchers.